Barack Obama says he’ll keep 9,800 US troops in Afghanistan through 2015, after Afghan President Ashraf Ghani requested them to stay. Critics say the move could mean the US maintaining a military presence past the 2016 pullout deadline. Obama was planning to cut the number of troops from the current 9,800 to 5,000 by the end of this year, withdrawing completely by the end of 2016. There are also 3,000 troops from other NATO countries. "The specific trajectory of the 2016 US troop drawdown will be established later in 2015 to enable the US troop consolidation to a Kabul-based embassy presence by the end of 2016," the White House statement said. However, it now seems as though Washington is having second thoughts, with Ghani asking the US to show more flexibility concerning their withdrawal program. Speaking to RT, Sara Flounders, a US based political writer and anti-war activist was scathing at the move, adding that “no US troop deadlines for withdrawal from any country are ever met,” and said it was within US geo-political interests to stay put in Afghanistan. “US troops are renamed. They become advisers, trainers, consultants – there are lots of contractors that are hired and they refer to hand downs and drawbacks. But really there is US determination to stay in Afghanistan, which is a very key region in Central Asia and it, is part of their determination to control the entire region,” she said. New fact sheet on strengthening the strategic partnership of the United States and #Afghanistan: http://t.co/zpSRZiz7gS. 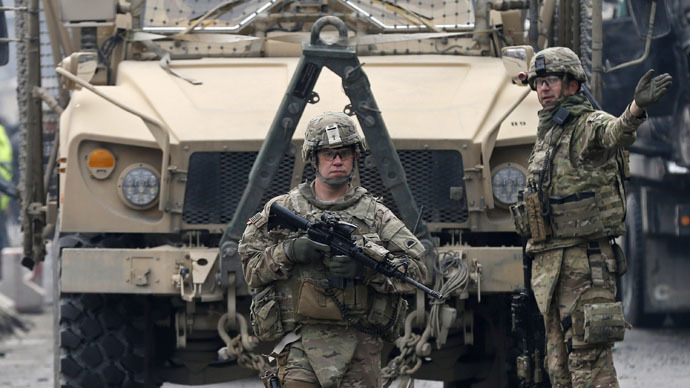 President Obama has spoken of the need to continue to help Afghanistan, saying the delay in sending back US troops was to help the Afghan forces prepare for a volatile spring offensive, when the Taliban are expected to make attacks. “The countryside is almost completely controlled by the Taliban and parts of Kabul are controlled by the Taliban, certainly at night. This is really an endless task,” he told RT. A recent report by Human Rights Watch in early March said the US’s desire to have security at any cost is giving some members of the Afghan authorities to act with absolute impunity, which allows them to get away with murder and torture. “The previous Afghan government and the United States enabled powerful and abusive individuals and their forces to commit atrocities for too long without being held to account,” said Phelim Kine, HRW’s deputy Asia director. Kine also mentioned that while the US is backing anti-corruption measures it is also helping to protect officials, who have been accused of corruption, yet are seen as vital in helping in the war effort. He added that increasing levels of corruption and brutality in Afghan society is fostering a rise of the Taliban. Washington has pledged $4 billion a year through to 2017 to help fund the Afghan security forces, however, Arikat says that US spending in the region is spiraling out of control. “If you look at the cost projected by Harvard University for the wars in Afghanistan and Iraq, we are looking at a sum of around $6 trillion. This is not small change. It could fix the entire infrastructure of the United States, such as roads and bridges, which are falling apart, and hospitals. They are in for the long haul, it’s going to cost a lot more money and to be honest, the country has not really made a lot of gains,” Arikat added. Flounders was equally critical, saying the use of US taxpayers money to fund overseas wars is rarely mentioned by the media at home. She added there are a lot of hidden costs, which the general US taxpayer has no idea about, such as the cost of electing Ghani as president or keeping US troops in “thousands of bases,” around the world.